Maps presented here have been prepared with the kind permission of Curious World Maps, used worldwide for illustrating news and documentary reports on television and the internet. Navigation charts are edited from charts published by the Defense Mapping Agency. Orientation maps are linked from the thumbnail images at right to locate place names identified elsewhere on this site. Orientation maps include the Nordic Seas, Atlantic Crossing, Caribbean Sea, North Africa, Mediterranean Sea, Java Sea, Coral Sea, New Guinea, Pacific Islands, Philippine Islands, Japan and southern approaches and Aleutian Islands. 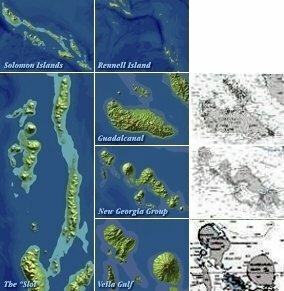 Area maps provide additional detail regarding the Solomon Islands, Sicily, Italy and the South of France. Operations of individual ships: on home pages for most selected ships and accompanying first-person accounts for Bennett and Newcomb. Descriptions of events: The Battle of Rennell Island, the Battle of Tassafaronga, the Battle of Vella Gulf, the Battle of Cape St. George, the Battle of Surigao Strait and the entry into Japanese home waters, Sagami Wan and Tokyo Bay (below). Modern digital technology makes possible a degree of accuracy that far surpasses that available to writers of deck logs, after action reports, etc. at the time of an event. Often, multiple sources do not agree on positions; even multiple charts from single sources may be discrepant. A major objective in preparing track charts for this site, therefore, has been to depict information from trusted sources in a consistent manner. In some cases, this involves scanning and tracing originals. In others it involves replotting courses using information given in deck logs and then attempting to correct for turning radii, known positions, etc.